Fabian Debora, Alex Kizu and Juan Carlos Muñoz Hernandez, ''Transformation of Spirits Exposed,'' 2012, collaborative painting. The Los Angeles neighborhood of Boyle Heights is located on the East bluff of the L.A. River. A location that has long been a destination for new immigrants, it’s also a neighborhood associated with poverty and violence. So it is refreshing to see guest curator Annie Buckley highlight three individuals from Boyle Heights who use art to overcome great challenges. The stories of Fabian Debora, Alex Kizu, and Juan Carlos Muñoz Hernandez are extremely emotional and inspirational in the revealing "Bridging Homeboy Industries." Pastor and author Gregory Joseph Boyle founded Homeboy Industries in 1992 to address the escalating problems of youth involved in gang related lifestyles. Originally conceived as a job-training center in the late 1980s, Homeboy Industries now provides an alternative education and training for folks to escape gang related lifestyles. Services include mental health programs, legal help, tattoo removal, education, and employment training. However, the most endearing service Homeboy Industries offers is its small business opportunities for individuals that are tagged as high-risk youth or former gang members. All those who participate learn skill sets that will allow them to become marketable and competitive. Among the many businesses founded have been Homeboy Bakery, Homeboy Silkscreen & Embroidery, and Homeboy Grocery. Through these experiences, Father Boyle found that gang members choose to leave that life given the opportunity. Father Boyle was instrumental in influencing each of the artists included in this exhibit. Whether it was commissioning works or aiding their formal education, they each developed a unique voice that embraces and utilizes the context of East L.A.
Debora’s realistic paintings and drawings provide an excellent entry point into the exhibition. His graphite renditions of lampposts are bold, tight, and distinctly L.A. The careful craftsmanship and rendering places them at unique spots in the city, but they could also easily be lost among the many that dot the landscape. These lampposts typify how art arises from our seemingly banal surroundings. The series, entitled "Distinctions," feels sterile, however, in comparison to Debora’s earlier work, which was rooted in painful emotions. A pair of Converse hi-tops hangs from a telephone line in the painting "Convicted All Star." Reminiscent of the act of shoefiti, or shoe flinging, it involves tying laces together and throwing them at a power line so they hang overhead. Myths abound as to the meaning of such occurrences in urban settings. Folks believe it signals the place where drugs are sold or the location of gang related deaths. This is not necessarily true but the dark colors and formidable sky point certainly reference such associations. The work of Kizu involves the aesthetic of graffiti mixed with Japanese iconography. 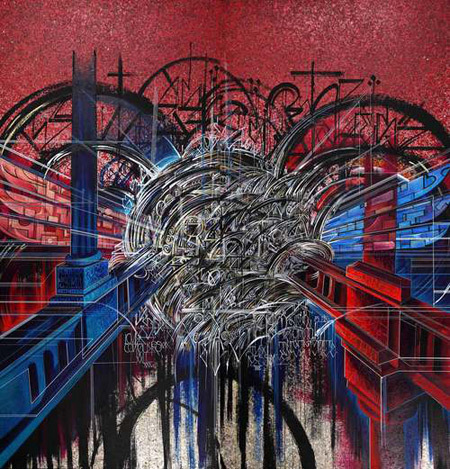 Part of the Pasadena Museum of California Art’s "Street Cred: Graffiti Art from Concrete Walls to Canvas" exhibit in 2011, Kizu’s been working within this genre since the 1980s as a teenager. And his experience is evident from the depth and use of line, which takes the viewer on a roller coaster ride as one attempts to follow the rhythm and motion in his work. In "Moment of Clarity" black and white letters overlay a red background layered with writing organized in a grid. A mixture of multiple lettering styles, Kizu’s work bursts off the canvas from the center – as the letterforms begin to resemble an abstract expressionist canvas. Perhaps the most energetic compositions in the exhibition, Kizu’s works are easy to appreciate and tie directly into graffiti subculture and history. The bronze sculptures of Muñoz Hernandez are quite different from his colleagues. The organic shapes resemble the curves of intestines. Tube-like forms move in and out of each other like a twisted garden hose. The surprisingly traditional material is influenced by graffiti and one can imagine the letterforms melting into the three-dimension space. Some forms fall to the ground while others still manage to hold their shape and maintain an upright position. The once wild and strong lines are much softer and change size as they move in space, so they don’t display rigidity or any of the technical aspects that are honored in graffiti writing. Ironically the excitement and speed of graffiti is slowed with the heavy material. Plus the diminutive scale in works like "Bob" and "Quiz" make them more approachable as our eyes follow the movement much more readily. Graffiti can be overwhelming, but through these bronze works a single motion is highlighted and offers a welcome change of perspective. The combined narratives of Debora, Kizu, and Muñoz Hernandez fuel further interest in each artist’s respective work and expand upon conventional ideas of artists inspired by the urban landscape. While stylistically the artists do not necessarily compliment one another, the exhibition is a nod to the individualism and powerful services offered by Homeboy Industries, which has made such a difference in these artists' lives.